Introducción. La mutación E280A en el gen de presenilina 1 se encuentra asociada al grupo familiar más grande del mundo con enfermedad de Alzheimer. 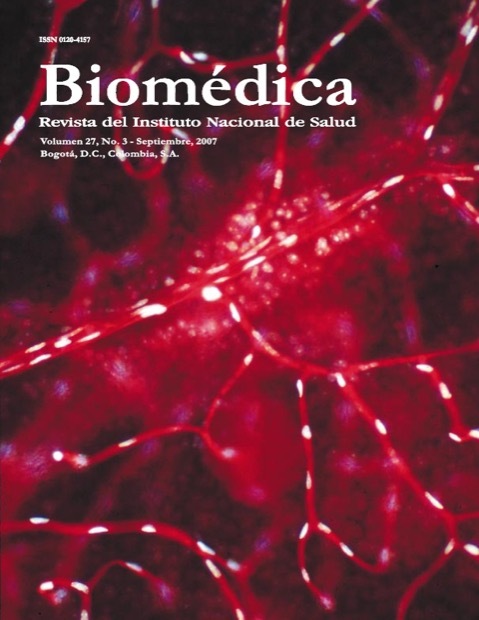 La presenilina 1 es un componente esencial del complejo g-secretasa, responsable de la producción del péptido b-amiloide, considerado clave en la fisiopatogenia de la enfermedad. Objetivo. Determinar si la mutación E280A en presenilina 1 incrementa la producción de b-amiloide, como reflejo de la ganancia de función g-secretasa. Materiales y métodos. Se evaluaron, por la tinción con rojo congo e inmunohistoquímica, depósitos sistémicos de b-amiloide en tejidos de cadáveres afectados, portadores de la mutación E280A en la presenilina 1 y cadáveres de no afectados. Se cuantificó por la técnica de ELISA el b-amiloide de 40 y 42 aminoácidos en cultivos de células CHO que expresan la proteína precursora de amiloide, transfectadas con los cADN de presenilina 1 portando las mutaciones M146L, E280A, DE9 y L392V. Resultados. Se encontraron depósitos proteicos en todos los tejidos estudiados y escasos depósitos de b-amiloide. No se encontró diferencia en la cantidad de depósitos, ni en su localización. No se observó incremento en la producción de b-amiloide en las células transfectadas con los cADN de presenilina 1 con las mutaciones comparadas con los controles. Conclusiones. La mutación E280A en presenilina 1 no aumentó la producción de b-amiloide en tejidos periféricos no neuronales o en el modelo in vitro, contrario a lo que sucede en una ganancia de función de g-secretasa. 1. Graeber MB, Mehraein P. Reanalysis of the first case of Alzheimer's disease. Eur Arch Psychiatry Clin Neurosci. 1999;249 (Suppl.3):10-3. 2. Bird TD. Clinical genetics of familial Alzheimer disease. En: Terry RD, Katzman R, Bick KL, eds. Alzheimer Disease. First ed. New York: Raven Press; 1994. p.65-74. 3. Bertoli-Avella AM, Oostra BA, Heutink P. Chasing genes in Alzheimer's and Parkinson's disease. Hum Genet. 2004;114:413-38. 4. Lopera F, Ardilla A, Martínez A, Madrigal L, Arango- Viana JC, Lemere CA, et al. Clinical features of earlyonset Alzheimer disease in a large kindred with an E280A presenilin-1 mutation. JAMA. 1997;277:793-9. 5. Verdile G, Fuller S, Atwood CS, Laws SM, Gandy SE, Martins RN. The role of beta amyloid in Alzheimer's disease: still a cause of everything or the only one who got caught? Pharmacol Res. 2004;50:397-409. 6. Pietrzik C, Behl C. Concepts for the treatment of Alzheimer's disease: molecular mechanisms and clinical application. Int J Exp Pathol. 2005;86:173-85. 7. De Strooper B. Aph-1, Pen-2, and Nicastrin with Presenilin generate an active gamma-Secretase complex. Neuron. 2003;38:9-12. 8. Edbauer D, Winkler E, Regula JT, Pesold B, Steiner H, Haass C. Reconstitution of gamma-secretase activity. Nat Cell Biol. 2003;5:486-8. 9. Vardy ER, Catto AJ, Hooper NM. Proteolytic mechanisms in amyloid-beta metabolism: therapeutic implications for Alzheimer's disease. Trends Mol Med. 2005;11:464-72. 10. Brunkan AL, Goate AM. Presenilin function and gamma-secretase activity. J Neurochem. 2005;93:769-92. 11. Borchelt DR, Thinakaran G, Eckman CB, Lee MK, Davenport F, Ratovitsky T, et al. Familial Alzheimer's disease-linked presenilin 1 variants elevate Abeta1-42/1-40 ratio in vitro and in vivo. Neuron. 1996;17:1005-13. 12. Vetrivel KS, Thinakaran G. Amyloidogenic processing of beta-amyloid precursor protein in intracellular compartments. Neurology. 2006;66 (Suppl. 1):S69-73. calpains and caspase-12. Neurobiol Dis. 2002;11:2-19. 14. Joachim CL, Mori H, Selkoe DJ. Amyloid beta-protein deposition in tissues other than brain in Alzheimer's disease. Nature. 1989;341:226-30. 15. Govoni S, Gasparini L, Racchi M, Trabucchi M. Peripheral cells as an investigational tool for Alzheimer's disease. Life Sci. 1996;59:461-8. 16. Suzuki T, Nishiyama K, Murayama S, Yamamoto A, Sato S, Kanazawa I, et al. Regional and cellular presenilin 1 gene expression in human and rat tissues. Biochem Biophys Res Commun. 1996;219:708-13. 17. Selkoe DJ. Physiological production of the beta-amyloid protein and the mechanism of Alzheimer's disease. Trends Neurosci. 1993;16:403-9. 18. Mehta PD, Pirttila T, Patrick BA, Barshatzky M, Mehta SP. Amyloid beta protein 1-40 and 1-42 levels in matched cerebrospinal fluid and plasma from patients with Alzheimer disease. Neurosci Lett. 19. Citron M, Diehl TS, Gordon G, Biere AL, Seubert P, Selkoe DJ. Evidence that the 42- and 40-amino acid forms of amyloid beta protein are generated from the beta-amyloid precursor protein by different protease activities. Proc Natl Acad Sci USA. 1996;93:13170-5. 20. Wiley JC, Hudson M, Kanning KC, Schecterson LC, Bothwell M. Familial Alzheimer's disease mutations inhibit gamma-secretase-mediated liberation of betaamyloid precursor protein carboxy-terminal fragment. J Neurochem. 2005;94:1189-201. 21. Cruts M, Van Broeckhoven C. Presenilin mutations in Alzheimer's disease. Hum Mutat. 1998;11:183-90. 22. Hardy J. Testing times for the "amyloid cascade hypothesis". Neurobiol Aging. 2002;23:1073-4. 23. Selkoe DJ. Alzheimer disease: mechanistic understanding predicts novel therapies. Ann Intern Med. 2004;140:627-38. 24. Selkoe DJ. Defining molecular targets to prevent Alzheimer disease. Arch Neurol. 2005;62:192-5.
histotecnológicos. Washington, D.C.: Instituto de Patología de los Estados Unidos de América (ARP); 1995. p.151-73. 26. Haass C, Schlossmacher MG, Hung AY, Vigo-Pelfrey C, Mellon A, Ostaszewski BL, et al. Amyloid beta-peptide is produced by cultured cells during normal metabolism. Nature. 1992;359:322-5. 27. Xia W, Zhang J, Kholodenko D, Citron M, Podlisny MB, Teplow DB, et al. Enhanced production and oligomerization of the 42-residue amyloid beta-protein by Chinese hamster ovary cells stably expressing mutant presenilins. J Biol Chem. 1997;272:7977-82. 28. Johnson-Wood K, Lee M, Motter R, Hu K, Gordon G, Barbour R, et al. Amyloid precursor protein processing and A beta42 deposition in a transgenic mouse model of Alzheimer disease. Proc Natl Acad Sci USA. 1997;94:1550-5. 29. Seubert P, Vigo-Pelfrey C, Esch F, Lee M, Dovey H, Davis D, et al. Isolation and quantification of soluble Alzheimer's beta-peptide from biological fluids. Nature. 1992;359:325-7. 30. Thinakaran G, Borchelt DR, Lee MK, Slunt HH, Spitzer L, Kim G, et al. Endoproteolysis of presenilin 1 and accumulation of processed derivatives in vivo. Neuron. 1996;17:181-90. 31. Westermark GT, Johnson KH, Westermark P. Staining methods for identification of amyloid in tissue. Methods Enzymol. 1999;309:3-25. 32. Deane R, Du YS, Submamaryan RK, LaRue B, Jovanovic S, Hogg E, et al. RAGE mediates amyloidbeta peptide transport across the blood-brain barrier and accumulation in brain. Nat Med. 2003;9:907-13. 33. Mercken M, Takahashi H, Honda T, Sato K, Murayama M, Nakazato Y, et al. Characterization of human presenilin 1 using N-terminal specific monoclonal antibodies: Evidence that Alzheimer mutations affect proteolytic processing. FEBS Lett. 1996;389:297-303. 34. Laudon H, Karlstrom H, Mathews PM, Farmery MR, Gandy SE, Lundkvist J, et al. Functional domains in presenilin 1: the Tyr-288 residue controls gammasecretase activity and endoproteolysis. J Biol Chem. 2004;279:23925-32. 35. Ikeuchi T, Dolios G, Kim SH, Wang R, Sisodia SS. Familial Alzheimer disease-linked presenilin 1 variants enhance production of both Abeta 1-40 and Abeta 1-42 peptides that are only partially sensitive to a potent aspartyl protease transition state inhibitor of "gammasecretase". J Biol Chem. 2003;278:7010-8. 36. Murphy MP, Uljon SN, Golde TE, Wang R. FADlinked mutations in presenilin 1 alter the length of Abeta peptides derived from betaAPP transmembrane domain mutants. Biochim Biophys Acta. 2002;1586:199-209. 37. Durkin JT, Murthy S, Husten EJ, Trusko SP, Savage MJ, Rotella DP, et al. Rank-order of potencies for inhibition of the secretion of abeta40 and abeta42 suggests that both are generated by a single gammasecretase. J Biol Chem. 1999;274:20499-504. 38. Chen F, Gu Y, Hasegawa H, Ruan X, Arawaka S, Fraser P, et al. Presenilin 1 mutations activate gamma 42-secretase but reciprocally inhibit epsilon-secretase cleavage of amyloid precursor protein (APP) and S3-cleavage of notch. J Biol Chem. 2002;277:36521-6. 39. Nakaya Y, Yamane T, Shiraishi H, Wang HQ, Matsubara E, Sato T, et al. Random mutagenesis of presenilin-1 identifies novel mutants exclusively generating long amyloid beta-peptides. J Biol Chem. 40. Jankowsky JL, Fadale DJ, Anderson J, Xu GM, Gonzales V, Jenkins NA, et al. Mutant presenilins specifically elevate the levels of the 42 residue betaamyloid peptide in vivo: evidence for augmentation of a 42-specific gamma secretase. Hum Mol Genet. 2004;13:159-70. 41. Walker ES, Martínez M, Brunkan AL, Goate A. Presenilin 2 familial Alzheimer's disease mutations result in partial loss of function and dramatic changes in Abeta 42/40 ratios. J Neurochem. 2005;92:294-301. 42. Takeda K, Araki W, Tabira T. Enhanced generation of intracellular Abeta42 amyloid peptide by mutation of presenilins PS1 and PS2. Eur J Neurosci. 2004;19:258-64. 43. Borchelt DR, Ratovitski T, van Lare J, Lee MK, Gonzales V, Jenkins NA, et al. Accelerated amyloid deposition in the brains of transgenic mice coexpressing mutant presenilin 1 and amyloid precursor proteins. Neuron. 1997;19:939-45. 44. De Strooper B, Simons M, Multhaup G, Van Leuven F, Beyreuther K, Dotti CG. Production of intracellular amyloid-containing fragments in hippocampal neurons expressing human amyloid precursor protein and protection against amyloidogenesis by subtle amino acid substitutions in the rodent sequence. EMBO J. 1995;14:4932-8. 45. Sarasa M. Experimental models for Alzheimer's disease research. Rev Neurol. 2006;42:297-301. 46. Ma G, Li T, Price DL, Wong PC. APH-1a is the principal mammalian APH-1 isoform present in gammasecretase complexes during embryonic development. J Neurosci. 2005;25:192-8. 47. Hebert SS, Serneels L, Dejaegere T, Horre K, Dabrowski M, Baert V, et al. Coordinated and widespread expression of gamma-secretase in vivo: evidence for size and molecular heterogeneity. Neurobiol Dis. 2004;17:260-72. 48. Shirotani K, Edbauer D, Prokop S, Haass C, Steiner H. Identification of distinct gamma-secretase complexes with different APH-1 variants. J Biol Chem. 2004;279:41340-5. 49. Capell A, Grunberg J, Pesold B, Diehlmann A, Citron M, Nixon R, et al. The proteolytic fragments of the Alzheimer's disease-associated presenilin-1 form heterodimers and occur as a 100-150-kDa molecular mass complex. J Biol Chem. 1998;273:3205-11. 50. Herl L, Lleo A, Thomas AV, Nyborg AC, Jansen K, Golde TE, et al. Detection of presenilin-1 homodimer formation in intact cells using fluorescent lifetime imaging microscopy. Biochem Biophys Res Commun. 2006;340:668-74. 51. Stromberg K, Hansson EM, Laudon H, Bergstedt S, Naslund J, Lundkvist J, et al. Gamma-secretase complexes containing N- and C-terminal fragments of different presenilin origin retain normal gammasecretase activity. J Neurochem. 2005;95:880-90. 52. Thinakaran G, Harris CL, Ratovitski T, Davenport F, Slunt HH, Price DL, et al. Evidence that levels of presenilins (PS1 and PS2) are coordinately regulated by competition for limiting cellular factors. J Biol Chem. 997;272:28415-22. 53. Evin G, Canterford LD, Hoke DE, Sharples RA, Culvenor JG, Masters CL. Transition-state analogue gamma-secretase inhibitors stabilize a 900 kDa presenilin/nicastrin complex. Biochemistry.